The generator creates integration tests for web pages. For every web page a default integration test is created without having to add anything to the model. The purpose of a default integration test is to have a quick means to test whether the basic functionality of the page works fine. For more complex or more detailed tests, a DSL that is dedicated to the modeling of tests needs to be used. The structure of the resulting code is identical, whether you use default tests or explicit tests. Currently, Arquillian depends on JUnit 4 and cannot be used with JUnit 5. JUnit 4 is a powerful, mature framework (latest stable version is 4.12), so this is a limitation but not a problem. For every modeled web page, the generator creates a Java source file [layout-Name]Page.java that supports the so-called page objects pattern. Those classes are being used by any integration test that gets generated, default and explicit ones. Having those classes for the abstraction of web pages significantly simplifies the writing and maintenance of integration tests. The JSF generators generate an elaborated mechanism that lets you import test data and implement readable, reusable and yet customizable tests. As usual, you can manually add code to any of the generated classes. This gives you the flexibility to implement any integration test that you can think of. At the begining of teach test, you always get a method prelude() generated. Its purpose is to do something with the web application to get to the page that you actually want to test. This could for instance be a login or search procedure that needs to be executed in order to get to the page under test. * entering the application when the first attempt was unsuccessful. 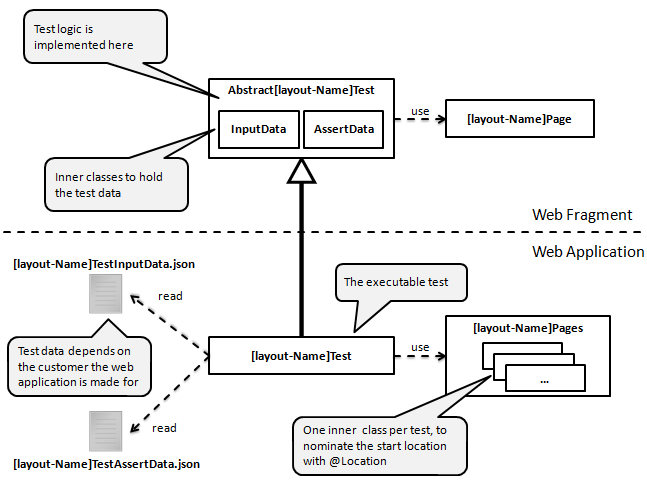 In contrast to the default tests, the names of the methods that hold the test implementation for explicit tests are derived from the modeled steps.